Spring Sale! 20% off site-wide, until April 23, 2019. Happy Passover and Happy Easter too!! 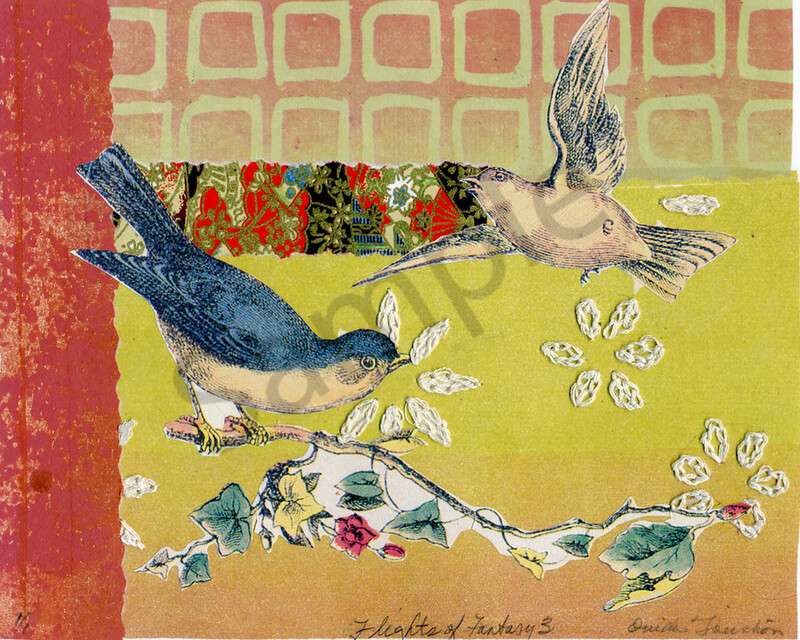 Various birds and butterflies in graphic handprinted designs in both original prints as well as archival reproductions in a variety of media, unframed. Each of these chine colle collages is hand printed and collaged with a lot of colorful paper fragments. The stitching is a recent innovation and I am enjoying producing a few with this experimental surface embellishment. Also available as original art for free shipping. Matted size 14x11, mat is neutral white and acid free. Use 'originalart' at check out for free shipping. Delight in the assorted winged creatures that I present to you as fine art hand-prints on assorted papers and mixed media. All original artworks ship for free from my studio. your shipping fees for original artwork,will be charged on checkout and will be refunded with the item when it is shipped. Return policy: If you are dissatisfied with your purchase, returns are accepted within 14 days. Please contact Ouida prior to returning a piece and be sure that the item is packed in its original packaging, tracked, and insured. You will be responsible for the cost of shipping, tracking, and insurance for your return. Refunds will be given once the item arrives safely, in its original condition, to Ouida's studio address. Terms of Service: Claims for defects, damages and/or shortages must be made by the client in writing within a period of ten (10) days after delivery of all or any part of the order through email. Ownership of all copyrights and the right to reproduce this artwork shall be retained by Ouida Touchon and are not offered to the owner of the original art piece. My artwork is created with a commitment to lasting quality and color fastness. I do a good bit of research on my inks, papers, glues and watercolors to assure the best in archival printing and matting with no compromises on the acid free content of all materials used. As with all artwork, never hang in direct sunlight. ***refunded shipping (yes, it's free!) on all original artwork! Enter your email below and I'll email you a 10% OFF Coupon right now! You can trust that I will keep your information confidential and will not share it.